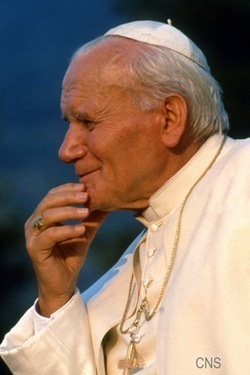 I was so pleased to learn of the joyous news that Pope John Paul II will be beatified on May 1. It’s particularly poignant that the Holy Father chose Divine Mercy Sunday as the day for his predecessor’s beatification. I am intending to go to Rome for the beatification. There is talk that 2 million people will come, very much like the huge crowds assembled for his funeral. This outpouring of affection is simply indicative of the sense of connection that Catholics around the world Catholics felt with this pope who expended himself to travel to the farthest places on the globe to carry the message of the Gospel and invite us to a deeper relationship with the Lord and to the mission that Christ has given to us. I enjoyed “Witness to Hope” very much, particularly the material that George shared on the Holy Father’s early ministry as a priest, because there you see the great themes of his life later on — working with young people, promoting marriage and his philosophical bent. It’s all present, as well as his mysticism and deep life of prayer that allowed him to suffer the loss of his entire family and come through the experiences of Nazism and Communism to be such an extraordinary leader in our Church and in the world. 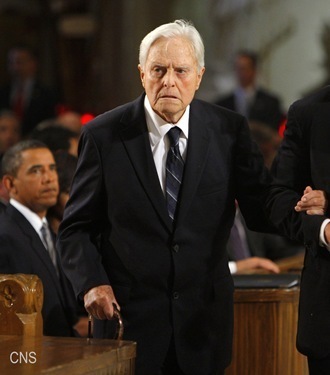 Also this week, we learned of the sad news of the passing of Sargent Shriver. I issued a statement this week that I want to share with you. Today we mourn the passing of one of America’s most beloved and respected citizens, R. Sargent Shriver. A champion for millions of people around the world as the founder of the Peace Corps, Sargent inspired us with his dedication to his family and public service. He changed the world for the better. His commitment to preserving and protecting human life at every stage of existence, especially for the unborn, and working to lift people out of poverty were exceptional gifts of love and humanity. He and his late wife Eunice showered us with their energy and devotion to faith and society and they shall remain ever in our thoughts and prayers. We extend our deepest condolences to his children, grandchildren, relatives and friends during their hour of sorrow. We pray for the repose of Sargent’s soul and we ask that God grant him eternal rest in His loving Kingdom. Sargent Shriver had a very inspiring record of public service — from serving as the first director of the Peace Corps under President Kennedy, to spearheading President Lyndon Johnson’s War on Poverty to the founding of his own Special Olympics. His great passion for service to the poor and those who needed a helping hand was born of a deep Catholic faith. As I mentioned in my post on the passing of his wife, I first met him when I celebrated Mass in his backyard for Cesar Chavez and 100 farm workers. (I think we trampled all over their flowers!) That was the kind of group that Sargent and Eunice Shriver opened their homes to, because they were so supportive of the Church’s social gospel. 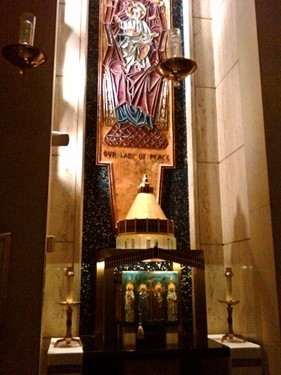 We pray for the repose of his soul and for the consolation of his children. This weekend in all the parishes of the Archdiocese we will be celebrating Evangelization Sunday. I recorded a video homily to ask all Catholics to become part of our upcoming outreach effort to invite and welcome our Catholic brothers and sisters home to Sunday Mass and to participation in the life of the Church. You can view this video homily below and read a press release about Evangelization Sunday here. 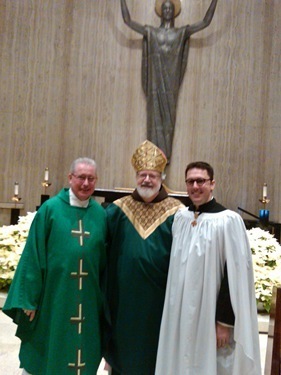 This past weekend, I was invited by Father Robert Robbins, the pastor, to celebrate Mass at Holy Family Parish in New York City. 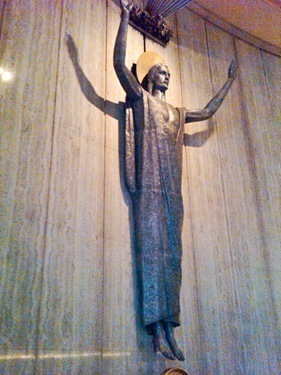 Holy Family is the parish that serves the United Nations. Paul Murray, the music director there, organized a very beautiful music program to mark my visit. He had heard from our Cathedral music director Leo Abbott, who had been his mentor, how much I enjoyed the Coronation Mass, so he included the Agnus Dei from that Mass and the Hymn of St. Francis — as well as a Gloria by our own Leo Abbott! He is a graduate of the Archdiocesan Choir School at St. Paul’s in Cambridge and has an extraordinary choir at Holy Family. Holy Family is a very international parish and many of the people I met there were diplomats. 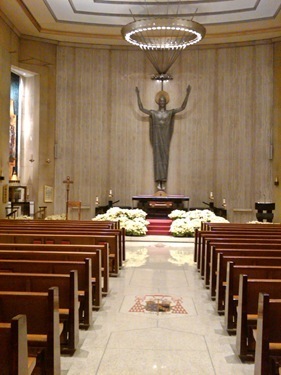 The pictures very much indicate the theme of peace in the church. 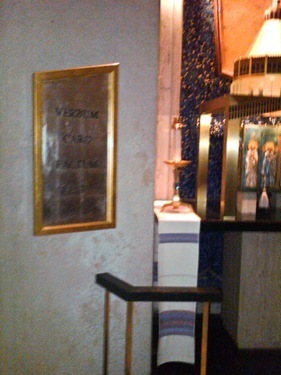 The church was visited by Pope Paul VI when he visited the United Nations in 1965. 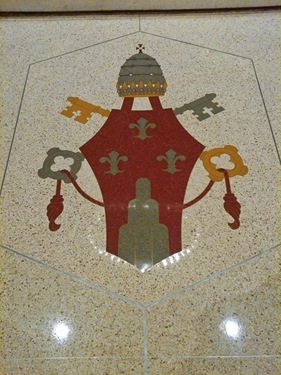 His coat of arms is on the floor. Pope Paul gave that stirring address, “Jamais la guerre”, French for “No More War.” It was an absolutely stunning appeal to the world for peace and cooperation among nations. 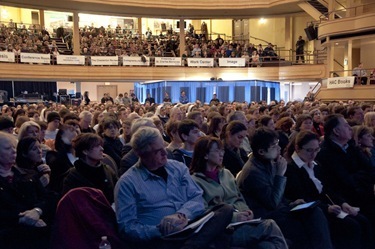 Then, with a very large Boston contingent, I was a part of the Communion and Liberation conference held in downtown Manhattan very near our monastery. Communion and Liberation, or CL for short, is an ecclesial lay movement in the Church, focusing on culture, education and charity. Its roots date back to the 1950’s, but the term “Communion and Liberation” was first used in 1969. 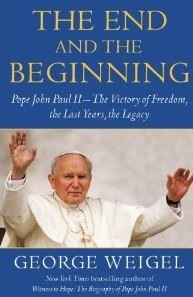 It grew internationally during the pontificate of John Paul II and today is seen in 80 countries including the United States. CL invites is members to recognize that Christ is the truest response to people’s deepest needs and has been throughout history. Its only requirement is that Christ be recognized as present. The person who recognizes this experiences a conversion affecting the individual and surrounding environment. Members meet through what they call “Schools of Community,” small groups that come together for catechesis and prayer. Their convention in New York was the same fateful day the Patriots lost to the Jets, despite my boastful comments that we were going to defeat New York, which got a rousing cheer from the Bostonians who were present — but nobody else! It turned out pride went before the fall. 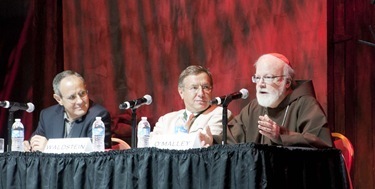 I was part of a panel with Father Julian Carron, who is now the president of the Fraternity of Communion and Liberation , and Dr. Michael Waldstein of Ave Maria University. Afterwards there was a meeting and a dialogue we had with Father Lorenzo Albecete, Olivetta Danese and various people participating in the gathering. Among those there with me was Father Jose Medina, principal of Cristo Rey Boston, was there and a number of other priests of the Priestly Fraternity of St. Charles Borromeo. 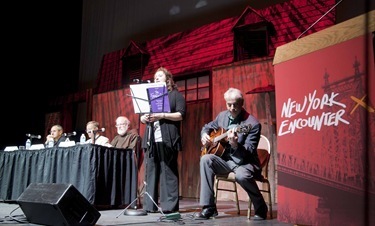 I told the people how privileged we are in Boston to have Communion and Liberation, the Fraternity and Memores Domini here in the archdiocese. Upon my return to Boston, I met with Christoph Graf, who is the Vice-Commandant, or the second in command, of the Swiss Guard. He joined me for dinner at the Cathedral, along with Andreas Widmer, a former member of the Swiss Guard, is a active in many ways in the archdiocese. 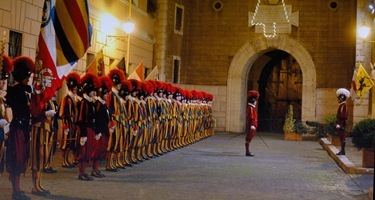 He brought us a lovely calendar of the Swiss Guards for this year. He is a German-speaking Swiss married to an Italian who is from San Giovani Rotondo. 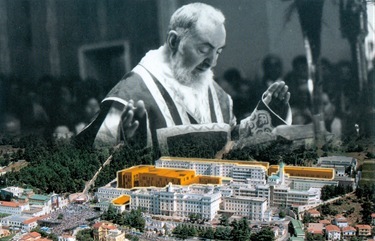 Her father was a close collaborator with Padre Pio on the building of his hospital, Casa Sollievo della Sofferenza, and Padre Pio baptized all of the family’s ten children. He is here in Boston brushing up on his English because, traveling with the pope for security, he frequently needs to interact with people in English. His English is very good but he is here to improve it. 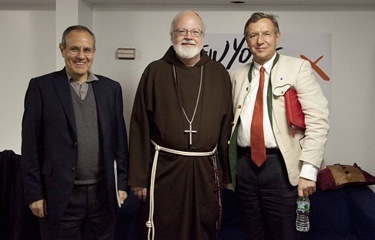 Christoph works very closely with Domenico Giani, who is a friend of mine and is in charge of security for the Holy See, so we were happy to have him visit. 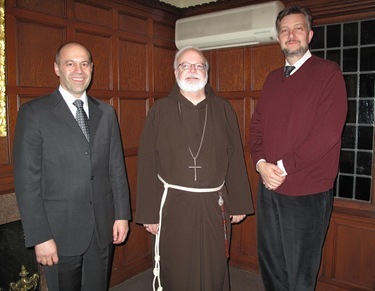 On Wednesday, I attended a luncheon for the staff of our office of the Pontifical Mission Societies. 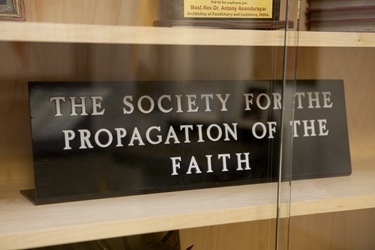 Of course, we are all probably most familiar with the Society for the Propagation of the Faith but the societies also include the Holy Childhood Association, the Society of St. Peter Apostle and the Missionary Union of Priests and Religious. We are very grateful to Father Rodney Copp for his generous service there, as well as Maureen Heil and all the other staff members, who are dedicated to the mission ad gentes. When we celebrated the bicentennial of the archdiocese, the delegation from the Archdiocese of Bordeaux, France, brought me the letters written by Bishop Benedict Fenwick asking for aid from the Society for the Propagation of the Faith of the Archdiocese of Bordeaux. 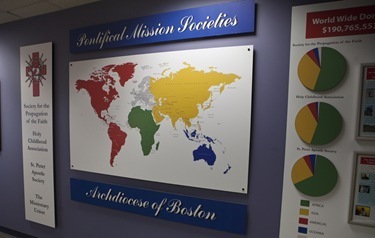 It always strikes me to remember that, as a young Church, we were the beneficiaries in our own diocese, and now Boston is one of the leading organizations of the Propagation of the Faith, raising much-needed money to support the missions throughout the world. 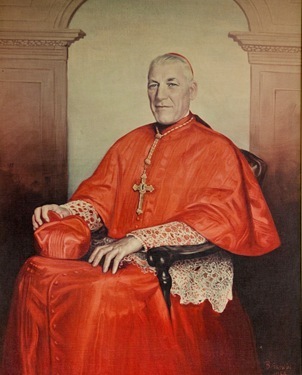 This tradition had always been present but received a very special impetus under Cardinal Cushing, who himself had been Prop director, and later longtime director Msgr. Andrew Connell. 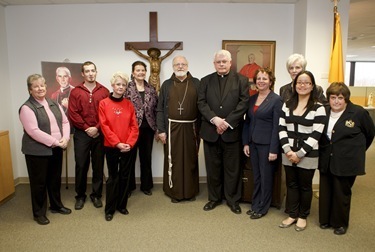 We’re very pleased they are now housed in our Pastoral Center in Braintree. 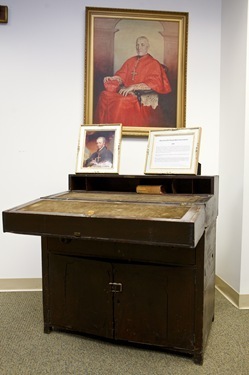 They have beautiful offices with a number of memorabilia, including a desk that belonged to our first bishop, Bishop Cheverus. This piece of household furniture belonged originally to the Right Rev. Jean Louis de Cheverus and Rev. Francis Mantignon. It served the twofold purpose of sideboard and writing desk, whereon were registered the marriages and baptisms of the infant congregation of the Church of Boston. It held a conspicuous place in the principal room of the humble Episcopal residence adjoining the Church of the Holy Cross on Franklin Street, which was used as a Sacristy, parlor, reception and dining room. It was fondly remembered by Reverend James Fitton from his boyhood days when he served as “sanctuary boy". When the Cathedral building was demolished, this memorable relic of the household furniture of the first Bishops of Boston was presented to Reverend James Fitton and Right Reverend F.B. Fitzgerald who left it for safekeeping to Sister Mary Honoree, first superior of the Sisters of Notre Dame in East Boston and her successors in office. 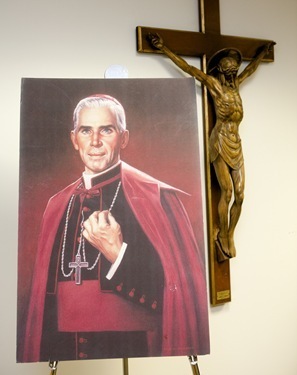 There are also maps of all the places that have been helped and a picture of Servant of God Fulton J. Sheen, who was a national director of Propagation of the Faith. I want to conclude this week by mentioning that we are holding a Vocations Discernment Retreat for men ages 18-40 at the Connor Retreat Center in Dover from Feb. 11-13. There is another, slightly shorter, retreat that same weekend at Blessed John XXIII Seminary, as well. Each year, we have this retreat as an opportunity for men to discern their vocation in an atmosphere of prayer. It is an opportunity to hear from our own seminarians about the experience of seminary life and to reflect on the vocation to priesthood and the mission of the priesthood in the world today. If you are interested in participating, or know someone whom we should invite, please contact Father Dan Hennessey in our Vocations Office at (617) 746-5949. Please pray for the men who plan attend this retreat as well as for an increase of vocations to the priesthood! Catholics Come Home – but what are they coming home to? The same abuses of power and trust – the same betrayals – the same hypocrites. Nothing’s changed. People have not left the Church just because they got bored – they simply don’t feel the Love of God within the walls of the Church. People are searching and finding what they need outside of the Church. The Church needs to look within and start to understand that the words they preach are meant for themselves as well as those they preach to. Think about it – if people felt the Love of God within the Church how could they walk away. It simply would not be possible. The problem is not with advertising – it’s with those who work for the Church.